and she got the ideas from these awesome blogs below!! and I showed them how to draw the elephant in these 6 simple steps! We talked about the Indian elephants and how they are adorned with fine linens and jewels! We talked about the endangered elephants species. 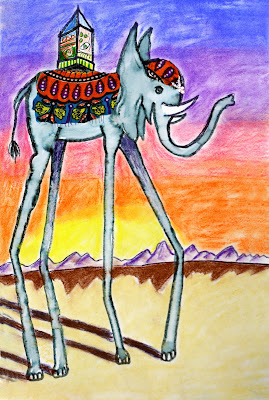 They were allowed to use drawing books and create other surreal creatures as well! I will post more when they are finished! These are amazing! I have been doing a Dali unit with my younger students myself. Have you read "Dali and the Path of Dreams"? An amazing book about Dali! I was thinking of the same exercise for my kids when I saw the elephants on the other blogs! If I hadn't been on maternity leave I would have beat you to it! Love the results! Thanks for posting these - I love them and will use this idea later this year when my students will be studying Dali! Would love to see more of this if anyone has anything to post. My kids did some today but I have since started questioning the shadow directions. Love, love the idea! Such a very beautiful elephant and lion painting arts picture and this article give us good idea how make arts different designee on paper thanks for sharing proofread my essay . How did the students create the backgrounds? just using crayons/oil pastels?